The Wounded Knee Massacre of December 29, 1890, known to U.S. military historians as the last battle in "the Indian Wars," was in reality another tragic event in a larger pattern of conquest, destruction, killing, and broken promises that continue to this day. On a cold winter's morning more than a century ago, the U.S. Seventh Cavalry attacked and killed more than 260 Lakota men, women, and children at Wounded Knee Creek in South Dakota. In the aftermath, the broken, twisted bodies of the Lakota people were soon covered by a blanket of snow, as a blizzard swept through the countryside. A few days later, veteran army surgeon John Vance Lauderdale arrived for duty at the nearby Pine Ridge Indian Reservation. Shocked by what he encountered, he wrote numerous letters to his closest family members detailing the events, aftermath, and daily life on the Reservation under military occupation. He also treated the wounded, both Cavalry soldiers and Lakota civilians. 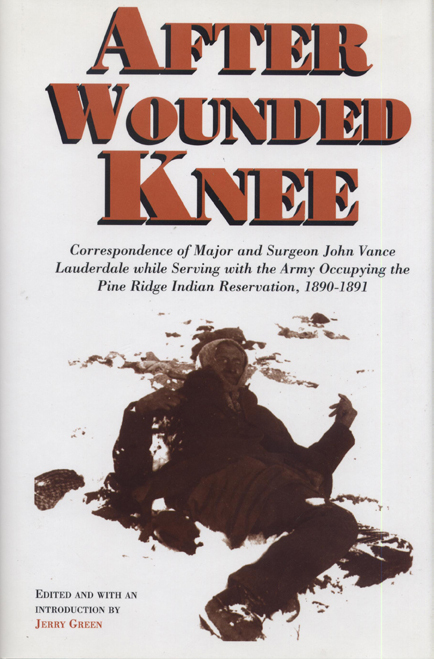 What distinguishes After Wounded Knee from the large body of literature already available on the massacre is Lauderdale's frank appraisals of military life and a personal observation of the tragedy, untainted by self-serving reminiscence or embellished newspaper and political reports. His sense of frustration and outrage toward the military command, especially concerning the tactics used against the Lakota, is vividly apparent in this intimate view of Lauderdale's life. His correspondence provides new insight into a familiar subject and was written at the height of the cultural struggle between the U.S. and Lakota people. Jerry Green's careful editing of this substantial collection, part of the John Vance Lauderdale Papers in the Western Americana Collection in Yale University's Beinecke Library, clarifies Lauderdale's experiences at the Pine Ridge Indian Reservation. Jerry Green is an independent scholar living in Fayetteville, Georgia. He has spent more than five years doing research on the events leading up to, and following, the massacre on Wounded Knee Creek.